Are you wondering whether you can do a gorilla habituation experience in Uganda from Kigali? Yes, you can easily connect from Rwanda to Uganda to do gorilla habituation experience. The easiest route is through Cyanika border of kisoro connecting to Rushaga sector south of Bwindi forest national park. The drive from Kigali to Bwindi takes roughly 4 hours. Travelers doing a 1-day gorilla habituation are therefore advised to wakeup as early as possible and leave Kigali at 3:00am to catch up with the pre-trekking/habituation briefing in Bwindi at 7:00am. Whereas most Rwanda Uganda safaris are to visit and track mountain gorillas, visitors can also do gorilla habituation in Uganda from Rwanda. Visitors fly into Kigali and then drive 4 hours crossing through Cyanika border to Uganda to make their dream come true. Gorilla habituation takes 2-3 years conducted by a team of researchers; conservationists and gorilla doctors to ensure mountain gorillas are in good health. What is gorilla habituation experience? 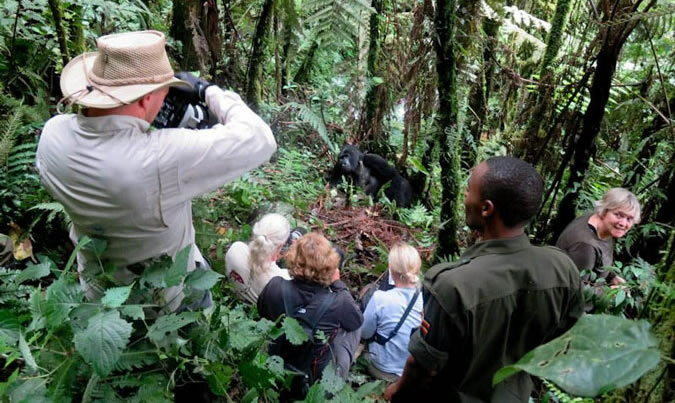 Gorilla habituation experience is the practice of training wild mountain gorillas with an aim of making them familiar with human presence before they are open to travelers for trekking. Gorilla habituation is conducted by a team of rangers, gorilla doctors, researchers, conservationists and travelers. With or without visitors, the habituation team must visit the being trained gorilla families everyday for 2-3 years. Just like in gorilla trekking, travelers to do gorilla habituation experience are required to have gorilla habituation permits. A single gorilla habituation permit costs $1500 to allow you send four hours with mountain gorillas. Eight permits are given out everyday 4 permits per gorilla group. A gorilla habituation quote includes the habituation permit, park entrance fees and the ranger fees. Which gorilla families are being habituated? At present Uganda Wildlife Authority (UWA) is training 2 gorilla groups. These are Bushaho and Binkyingi groups in Rushaga sector of Bwindi impenetrable forest national park. Four visitors visit each family everyday along with a team of gorilla doctors, conservationists. The gorilla habituation team must visit gorilla families undergoing habituation each day with or without visitors. On the day of habituation, travelers should expect waking up as early as possible so as to be at Bwindi head quarters in Rushaga sector. Here travelers are briefed on how to behave while with the gorillas to ensure their safety and for the endangered mountain gorillas. Travelers are advised to keep calm, in their groups and at a distance of 7 meters way from mountain gorillas. This is to prevent the spread of human wildlife communicable diseases, which are deadly to gorillas. The hiking time to see gorillas may be short of long depending on the location of a gorilla family and the speed of their movements. On reaching the gorillas, travelers together with the other training team spend four hours with gorillas. this is a time to closely observe the human like characters of gorillas and their social behaviors. The permit becomes invalid after our hours and travelers hike back. Like in trekking, visitors are given gorilla habituation certificates to congratulate them upon making it. Travelers going for habituation experience should be well prepared to spend over half day in the jungle. You must ensure to pack enough essentials to ensure safe and enjoyable encounter. Among the things every traveler must carry include hiking boots to ease movements in the slippery muddy forest grounds, gardening gloves, rain jackets for he unpredictable forest weather, sun glasses and hats to protect from direct sun. Also, ensure to pack enough drinking water and energy giving snacks to keep you strong in the hiking process .hiring a porter is very much recommended to ease hiking. Its advisable to book a lodge/camp in Rushaga sector if you are going for habituation experience. Fortunately, Rushaga has a variety of luxury, midrange and budget accommodation facilities to serve you with quality food and sleeping services at affordable rates. Among the recommended lodge/camps include Bwindi jungle lodge, gorilla valley lodge, Mutanda Lake Resort, Chameleon Hill Lodge, Gorilla Safari Lodge and Ichumbi Lodge among others. These lodges have professional staff to serve all your needs all day and night. Besides gorilla habituation experience, travelers to Rushaga sector of Bwindi have a variety of activities to do. These include gorilla trekking, bird watching, cultural tours and forest walks among others. These can do done to make your tour a complete safari package.